A backyard is not a true backyard until you have a few pairs of old and tattered garden wellies lying haphazardly outside your back door. Still, what happens when there’s just too many of them? You turn them into planters, of course. Here are five cute ideas for DIY garden rain boots. 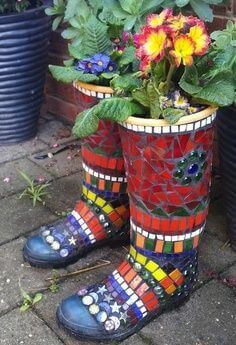 Since wellies are so cheap and easily transformable, you can buy several pairs or even paint old ones to match the flowers which you are growing in your garden. 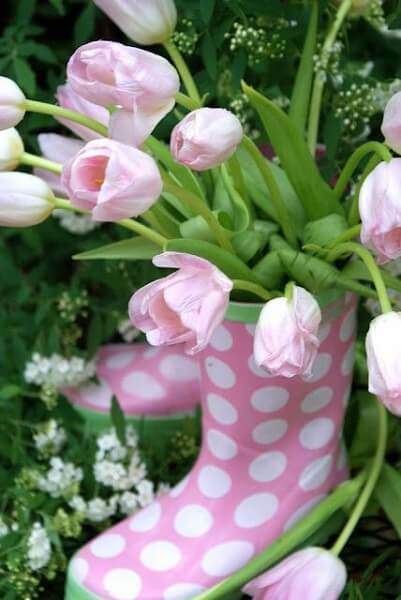 For example, if you happen to be cultivating some pink tulips, why not use a nice pair of pink and white polka dot wellies instead of a planter? Who doesn’t love pink? Of course, it’s undeniable that vases are a beautiful way to center flowers onto your garden table. But why stick to the traditional when you can choose a more rustic and bohemian path? 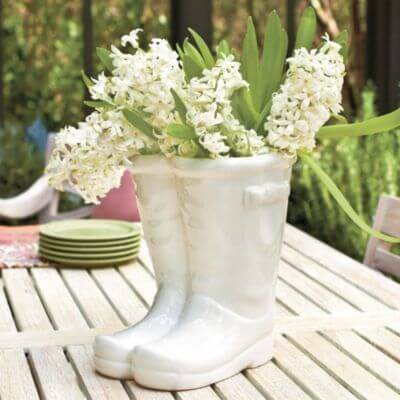 Try planting or simply putting some flowers into a pair of small rain boots and use the arrangement as a centerpiece. You can even use herbs instead of flowers, for wafting smells that go well with the good food. In fact, they are not so much bejeweled as they covered in pieces of mosaic . You can buy them or even salvage them from scrap. The important thing is to make them into a work of art by gluing them to your pair of tattered old garden wellies. When you have finished, you can go ahead and make some hole in the soles, add a few scoops of rich soil and plant your favorite flowers or herbs. 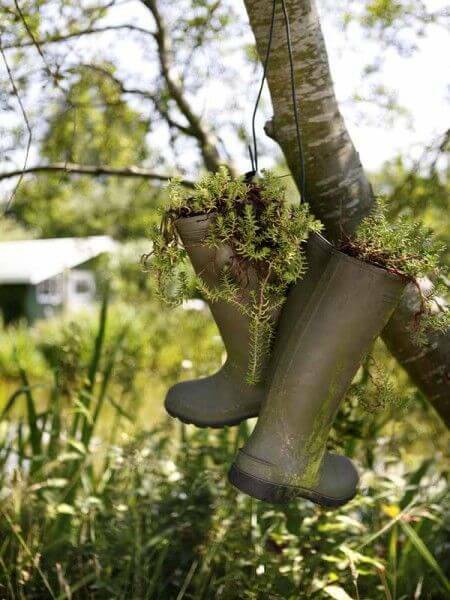 Another refreshing way of repurposing your old garden rain boots is by planting some moss or ferns in them and then hanging them in your favorite tree. Because they are standing right below the branches, they will be protected from too much sunlight and spur beautiful rich ferns. And since we’re on the topic of hanging garden wellies way up, here’s this. Here’s the last entry on our idea list. 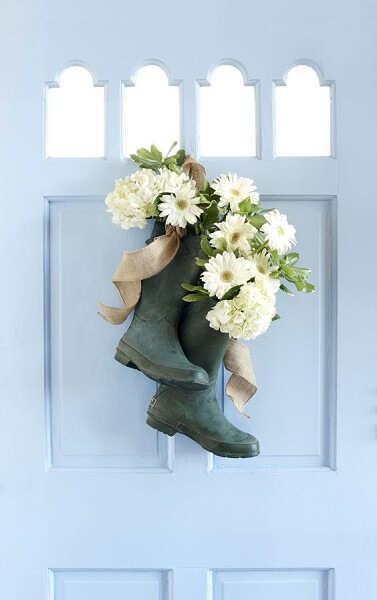 How about using your old garden rain boots instead of a flower wreath on the door? Give them a thorough wash and nail them to the door. You can then fill them up with seasonal flowers or even with poinsettias come Christmas time. Add some bows and ribbons and create a wonderful rustic decoration piece. Don’t ever throw away your old garden wellies because, as you can well see, there a lot of things you can do with them.